Hello and Welcome to a brand new Unboxing and Review with me, Sabrina. 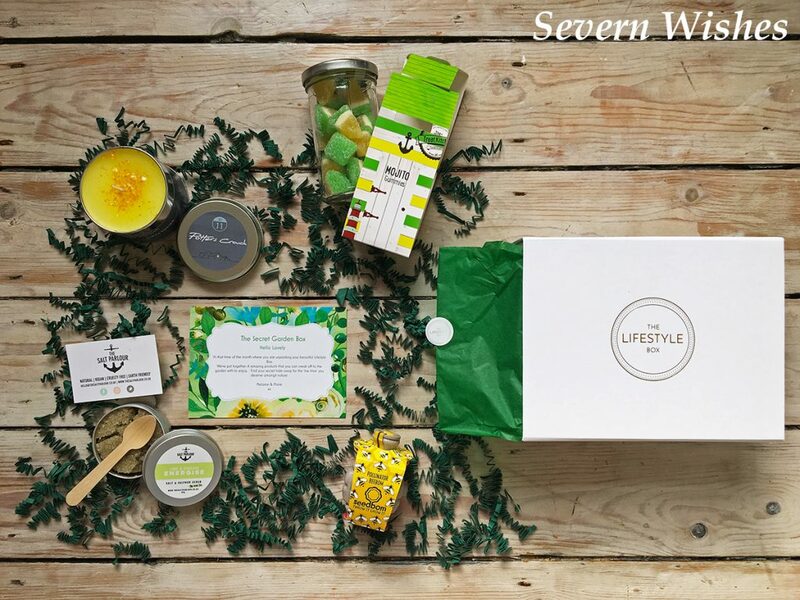 Today I have the pleasure of bringing you the Reveal of the July box from The Lifestyle Box Co. I’m excited to be bringing you this brand new collaboration on Severn Wishes. 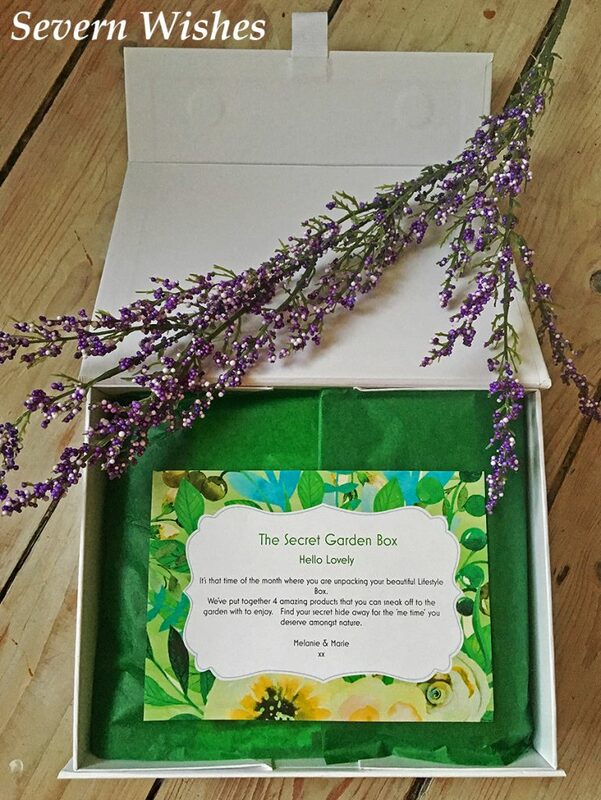 I have been approached by the lovely ladies at the company to unbox this Lifestyle orientated subscription box on my blog, and explain what the box and the company are all about. 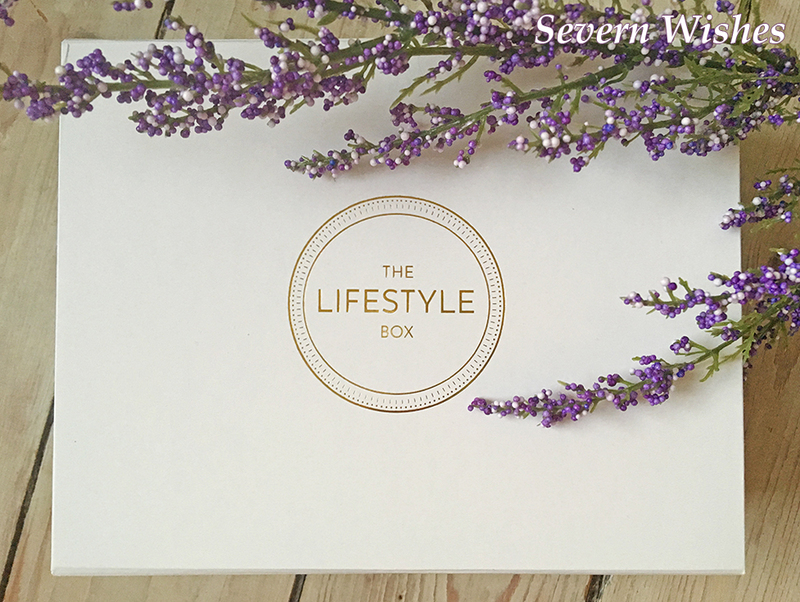 The Lifestyle Box Co is fast becoming a number one subscription box for women in the United Kingdom. If you love all things Lifestyle, you want high quality items and all while supporting an independent British company, then this is definitely the box for you! Inside this monthly subscription box you can find 4 treat items, these tend to be from the following category types. There’s Stationary, Homeware, Fragrance, Confectionery, Beauty and Jewellery. Whether you’re into treats for you or for your home, The Lifestyle Box Co has a little of everything to brighten up your month, all delivered direct to your door. The overall look of the subscription box is excellent, a professional logo sits centrally and the first thing I notice after that is its strong box to transport the items that are inside. The box is also reusable due to its fold over lid, because I have seen how durable it is I will certainly be reusing it for something. 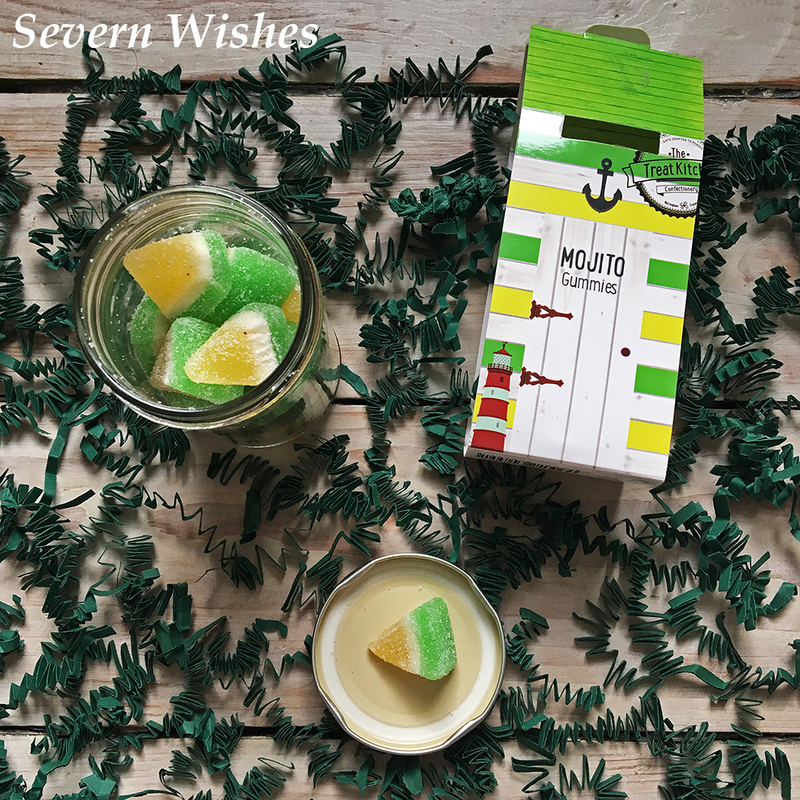 A jar of delicious sweets in Mojito flavour designed to sit inside their very own cardboard beach hut. 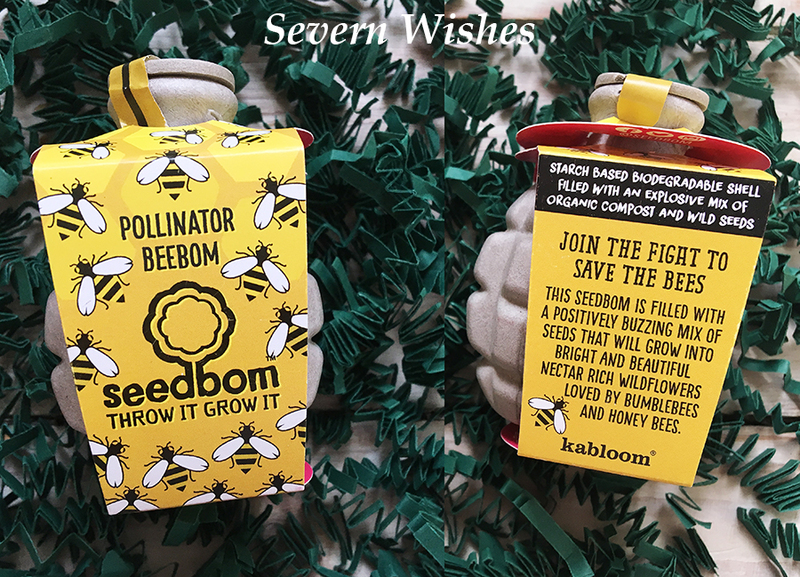 Kabloom – Seedbom – Pollinator BeeBom – Throw it Grow it! A Starch Based Biodegradable Shell that is Filled with Organic Compost and Wild Seeds to help the “Bom Thrower” Save The Bees! This mix is ideal for Honey Bees and Bumblebees! 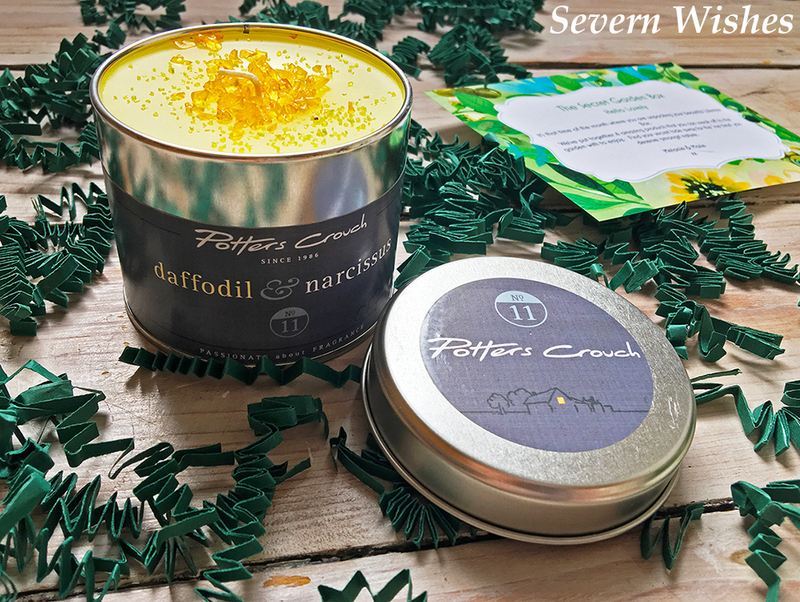 This Candle which smells of Daffodil and Narcissus (No11) is beautifully presented in a silver and black tin. Handmade in St Albans in Hertfordshire using Fine Fragrances and Superior Ingredients. Candle can be burned inside or outside and has a unique floral smell. A Vegan and Naturally Cruelty Free product that is ideal for the summer with people wanting to make sure their skin is in top condition for the sunshine. Treating your skin to a Natural and Earth Friendly product that smells divine! 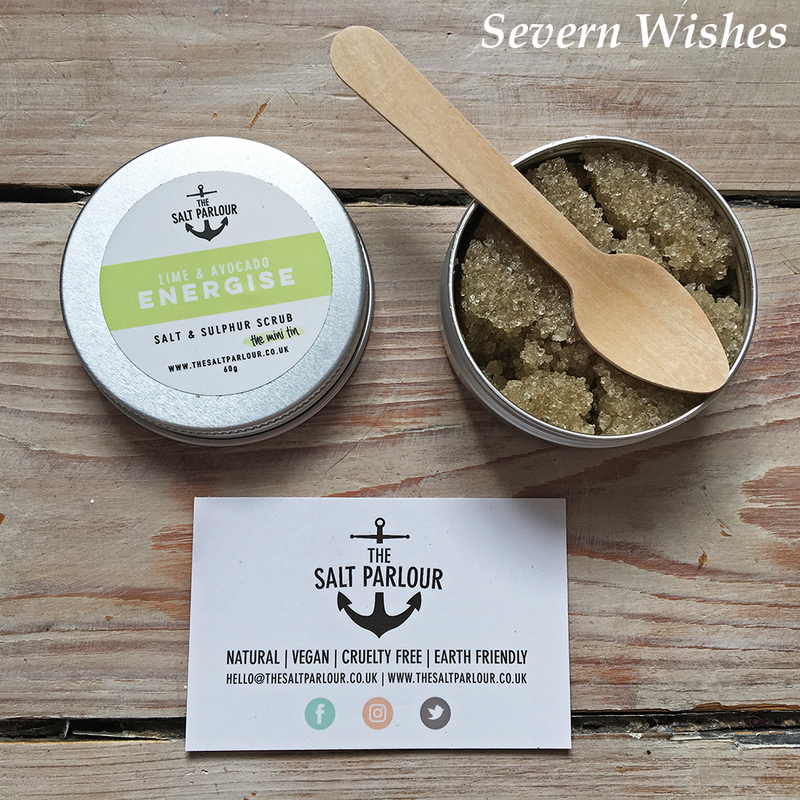 This salt and sulphur scrub comes as the mini tin with its own wooden spoon to help you get exactly the right amount of product out for each use. A zesty lime scent infused with the oil of avocado to leave your skin feeling amazingly nourished and glowing. Made in the United Kingdom. My overall thoughts about this subscription box are that the quality of its items out weighs many that are available on the market. I was impressed with how the box is put together. Not only was the theme well considered but the products inside are made to a high standard, those that state they are made in the UK is a bonus in my eyes. We are supporting business within our country and I would rather be doing that these days. I’m also impressed with how the theme goes throughout the products but nothing is duplicated. So one if for enjoying in a scented capacity, one is to consume, one is to use on the body and the other is for us to distribute and see what grows from it. The box has an overall great mixture of items, and I’m sure many people would appreciate a little bit of everything, including things we can do ourselves. There were two treats that I liked the most and I couldn’t choose between them. I am a huge fan of nature and grew up in rural countryside, so the “Seed Bom” resonated deeply for me with memories of fields of wild flowers, and I’m up for anything that helps with our Bees too! The other item has to be the Candle, what a gorgeously presented product, that not only is created to a high standard but it’s also handmade in the United Kingdom, I believe that effort can be seen and smelt in its quality. The Lifestyle Box Co are based in Cheshire and is an independent company ran by two inspiring women Marie & Melanie. 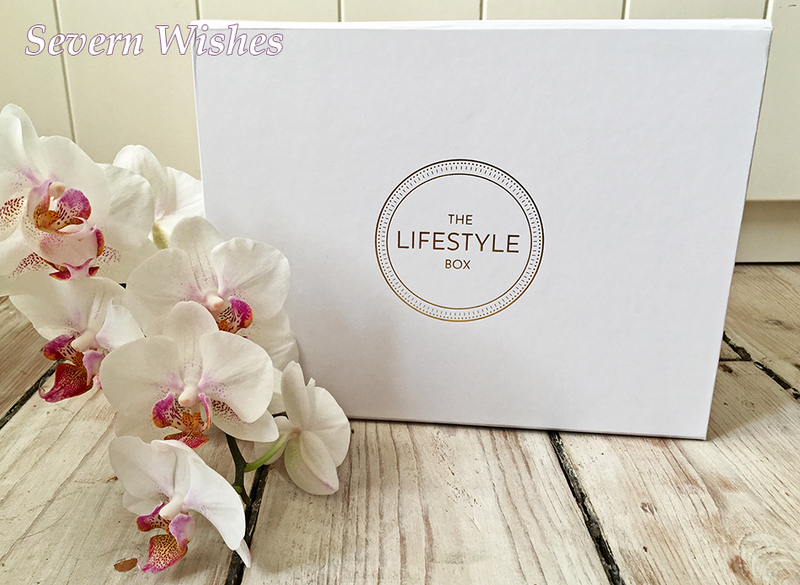 The aim of the Lifestyle box is to be a treat for women who enjoy the more luxurious of lifestyle items. Melanie and Marie believe people should be able to treat themselves and feel guilt free when it comes to self care and self love. Hard working women should be able to enjoy a treat without any worry, and all the better if the products are supporting small businesses and strong UK brands. “Melanie & I started the Lifestyle Box co for a number of reasons…..we are VERY alike, we love to shop and we have keen eye for hunting out beautiful items. Melanie is the ex head buyer at boohoo so brings a wealth of experience there too. We are big lovers of mindset, positivity, spirituality and ultimately self care. With the Lifestyle Box we saw that busy women were often putting themselves last on their long list of priorities so we love to embrace this as their guilt free moment in the month where they treat themselves for a job well done! We wanted to be more than just a beauty box….we adore beauty and pamper products, but then we equally adore gorgeous chocolate truffles, or a trinket for the Home, or a beautiful bit of stationary…. Our boxes have a monthly theme. Each theme has a colour and we build each box around that theme, carefully selecting four items that compliment each other beautifully. The subscription to The Lifestyle Box starts from £20 and you can subscribe from one month up to 6 on a prepay plan. It is a rolling monthly bill that has a renewal date of the 20th of each month, with the boxes themselves being dispatched on the 10th of each month. You can cancel your subscription at any time, and the boxes will always contain four items.So have you been convinced to look more into this incredible company owned by two passionate and independent women? If so then I will now leave some links below to their website and social media so that you may follow the brand at your own leisure. 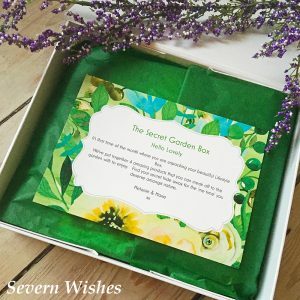 Thank you for visiting Severn Wishes today, I really hope that you’ve enjoyed reading this post as much as I have enjoyed reviewing the items. I would like to thank Marie and Melanie for approaching me to review this box, it has been a privilege to unbox such a gorgeous array of treats. Come back soon for more Reviews and Lifestyle! 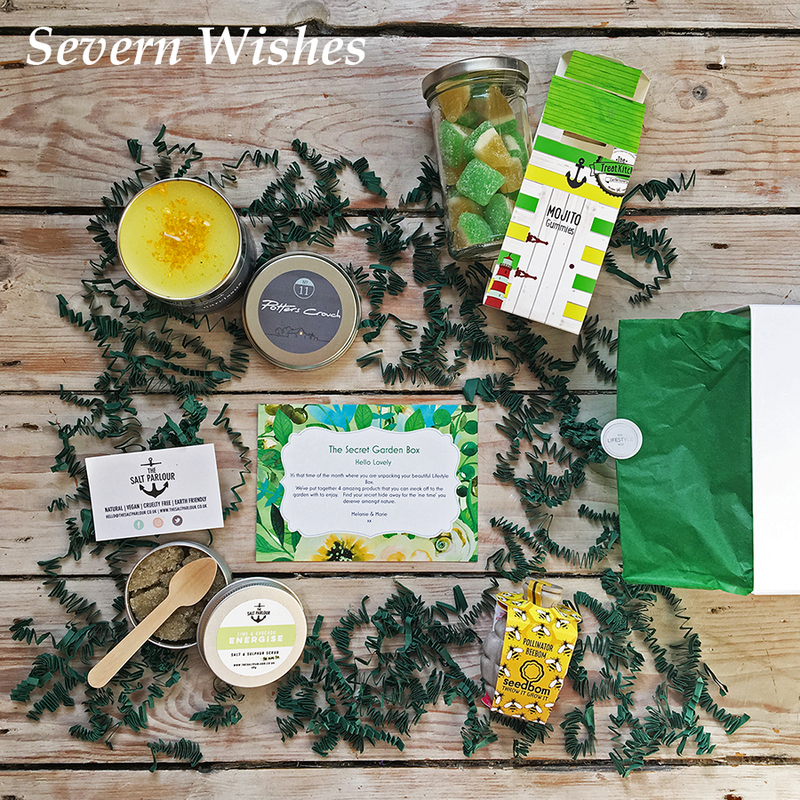 This entry was posted in Confectionery, Fragrance, Homeware, Kabloom - Seedbom, Lifestyle, Nature, Potters Crouch Candles, Reveals, Reviews, Skincare, Subscription Box, The Lifestyle Box Co, The Salt Parlour, The Treat Kitchen, Unboxing by Sabrina. Bookmark the permalink.